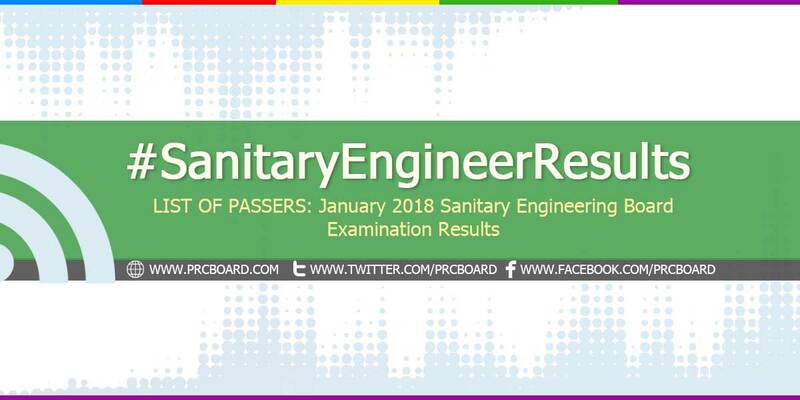 MANILA, Philippines – The January 2018 Sanitary Engineer board exam results including the full list of passers, top 10 examinees, top performing schools and related announcements are available at this website as PRC officially released the results online two (2) working days after the last day of board examination. As announced, 50 out of 96 examinees passed the exams. The Sanitary Engineer licensure exams are administered by PRC Board of Sanitary Engineering headed by its Chairman, Engr. Corazon De los Reyes-Romero and its members, Engr. Alfredo B. Espino and Engr. Florimond M. Lara on January 16-18, 2018 at PRC testing center in Manila. The schedule of online appointment for issuance of Professional ID and Certificate of Registration will be from January 25-26, 2018. Registration requirements: dduly accomplished Oath Form, Notice of Admission (for identification), 2 pieces of colored passport ID picture with white background and nametag, 2 sets of doc stamps and 1 piece of short envelope with name and profession written. As per Resolution No. 2017-1068 entitled "Schedule of Licensure Examination for Year 2018", the target release of January 2018 Sanitary Engineer board exam result will be on January 22, 2018 (Monday) or two (2) working days after the last day of practical exams. On the same board exams administered by PRC on August 2017, January 2017 and August 2016, results were out after two (2) working days. On the most recent exams conducted August 2017, 80 out of 155 examinees passed. Paulo Vincent Juan Jose from National University - Manila ranked first in the exams garnering 82.75% rating followed by John Ray Abaquita Labandero also from the same University having 82.31%. De La Salle University - Dasmariñas was the top performing school having 87.50% overall passing rate. On January 2017 SE exams, 62 out of 95 examinees passed. Jason Vergara Moral from National University - Manila topped the exams having 82.57% rating followed by Mary Camille Patolot Orendain from Mapua Institute of Technology - Manila garnering 80.80%. Batangas State University - Alangilan Campus was the only school in the top performing schools' list having 12 out of 15 examinees passed or 80.00% overall passing rate. Meanwhile, below is the table showing the number of examinees, total number of passers and overall passing rate in the last five (5) exams, courtesy of PRC. To receive up-to-date news about Sanitary Engineering results for January 2018, we advise our visitors to bookmark this page, visit PRC official website or follow us at our social media pages via Facebook and Twitter.